the junction of the Knife and Missouri Rivers (in modern North Dakota). years. At the time that Sacagawea became his squaw, Charbonneau had one or two other Indian wives. the next leg of their journey and collected information on the Indians and topography of the far West. "squaw woman" and baby became members of the exploring group. unlike Lewis, became very fond of both baby and mother. the Shoshone might be during the hunting season. A band of these Indians was found along the Lemhi River. Oregon, the adventurers built Fort Clatsop, where they spent the winter. friendly intentions a woman with a party of men is a token of peace." the junction of the Missouri and the Yellowstone. the Missouri River only as far as the Hidatsa villages at the mouth of the Knife River. superintendent for the Louisiana Territory. In 1811, Charbonneau sold back the tract to Clark. 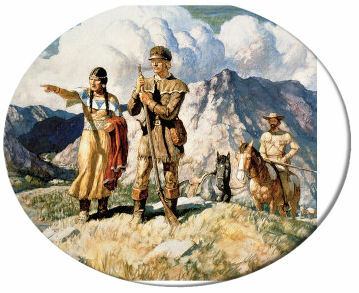 Sacagawea yearned to return to her homeland. of 1866, he died of pneumonia. Copyright 2010. For more details click on the Sacagawea links on the navigation bar at the left. 1812-1813. St. Louis: Missouri Historical Society. Schroer, Blanche (1970). Boat-pusher or Bird-Woman? Sacagawea or Sacajawea? Annals of Wyoming.